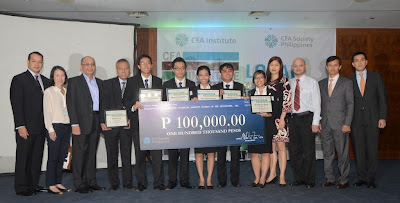 Midas Investments, composed of students from Ateneo de Manila University won the 5th CFA Institute Research Challenge (IRC) Local Finals held at the PSE Auditorium in Ortigas, Pasig City, besting 4 universities in the local finals out of the seven universities that joined this year’s CFA IRC. In the photo above: CEO and Chief Investment Officer of MBG Capital, Michael Garcia, CFA; ADMU team mentor Kelly Lim-Bate; Investment Relations Officer of Puregold, Inc. Mr. Jimmy Perez; Faculty Coach of ADMU Prof. Roberto Bayot; the CFA IRC Local Final Champions from Ateneo de Manila University Mikhael Florelio Llado, Mary Kryslette Bunyi, James Nicolas Cruz, Edrielle Paule Enriquez, and Ma. Regina Paz Onglao; CFA Philippines President April Lynn Tan, CFA; China Banking Corp First Vice President, Alexander Escucha; Banco de Oro Senior Vice President Marvin Fausto; and Sun Life Financial Chief Investment Office, Michael Gerard Enriquez. The four teams presented their findings about this year’s subject, Puregold Price Club, Inc.,to the four judges namely: Sun Life Financial Chief-Investment-Officer, Mr. Michael Gerard Enriquez; MBG Capital Chief Executive Officer and Chief Investment Officer, Mr. Michael Jack Garcia, CFA; BDO Senior Vice President and Chief-Investment-Officer, Mr. Marvin Fausto; and China Banking Corp. First Vice President, Mr. Alexander Escucha.. The IRC is a global competition which aims to educate the market in fundamental research report. Team CFA Philippines will begin preparations for the IRC Regional Finals to be held at Kuala Lumpur, Malaysia on February 22-23, 2013. The regional winner will then get to compete with top-notch schools at the global finals which will be held in London, United Kingdom on April 12, 2013. The CFA IRC Local Finals was also made possible through the competition’s sponsors: BPI Asset Management, COL Financial Group, Inc., AngPing and Associates Securities, MSCI, FTI Consulting, Inc., Avida Land Corporation, and the Philippine Stock Exchange. Four universities are competing at the Chartered Financial Analysts (CFA) Society of the Philippines Local Finals of its annual CFA Institute Research Challenge (IIRC) at the PSE Auditorium in Ortigas, Pasig City. The IRC is a global competition which aims to educate the market in fundamental research report. Out of the seven teams who joined and attended the Kick-off meeting last October, four teams made it to the local finals. The four teams are set to present their findings to a panel of experts. The winning team will earn a spot at the Regional Finals to be held at Kuala Lumpur, Malaysia on February 22-23, 2013. Meanwhile, the regional winner will get to compete with top-notch schools at the global finals which will be held in London, United Kingdom on April 12, 2013. Ms. Tan adds, “The IRC is also an excellent opportunity for finance students to interact with fellow students and finance professionals. This year’s finalists include teams from Ateneo de Manila University, De La Salle University-Dasmarinas, De La Salle University Manila, University of the Philippines-Visayas. The four teams will be presenting their materials to the four judges namely: Sun Life Financial Chief-Investment Officer, Mr. Michael Gerard Enriquez: MBG Capital Chief Executive Officer and Chief Investment Officer, Mr. Michael Jack Garcia, CFA; BDO Senior Vice President and Chief-Investment Officer, Mr. Marvin Fausto; and China Banking Corp. First Vice President Mr. Alexander Escucha. Last year, the University of the Philippines-Diliman won the local finals earning eligibility to represent the country for the 2011 Global CFA Institute Research Challenge. UP-Diliman also won the 2010 Global CFA Institute Research Challenge held in Hongkong, besting other international universities. 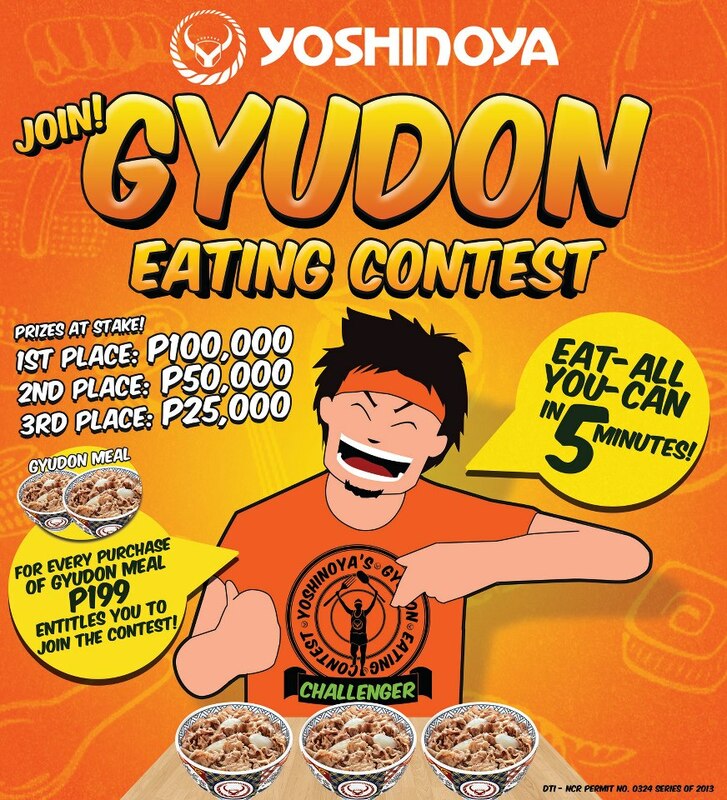 All for the love of free food and an attempt ‘to be a champ’ for bragging rights, I dared to eat my weekly calorie intake in one sitting at the recently concluded Yoshinoya’s Beef Gyudon Eating Madness held for the media (bloggers) people. That was indeed a great first time for an eating challenge experience. 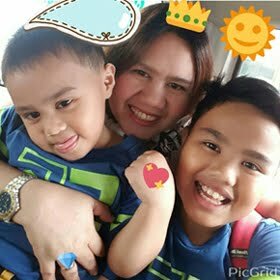 Although, I’m in the plus size, I don’t really have the knack for eat-all-you-can challenges; my body is such a betrayal for this truth hahaha. The challenge is on for the first person who could finish as many bowls of beef gyudon within 5 minutes. I was able to finish a bowl and already started my second when I chanced upon some of the guys already on their third. I lost the confidence to win the challenge, I just enjoyed eating the most tender beef gyudon I ever tasted wishing I could take home those we couldn’t finish eating. The guys are really competitive eaters, the top 3 were named and FPJ emerged as the big winner! Composed of two challenges, the contest is open to all male and femal participants 18 years old and above. 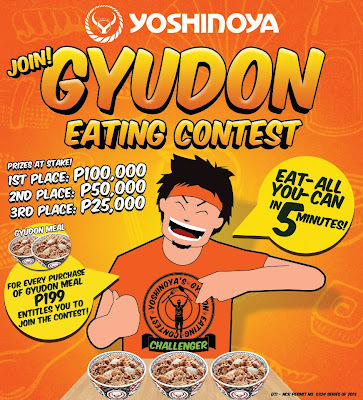 Qualifying Rounds will be held Monday through Friday at all Yoshinoya stores at 10:30 a.m. and 11:30 a.m., and then at 6 pm and 7 pm from January 21 up to February 15, 2013. To join, simply pay P199 at the counter, fill out the registration form and sign a health and release waiver. Customer must also present a valid ID (School ID, Company ID, Driver’s License, SSS ID, GSIS ID, NBI Clearance, Postal ID, Voters ID, or Passport) to the store manager. For the qualifying round, the beef bowls should be consumed in the store. The customer who finishes the most number of bowls or who has the least amount of leftover food in 5 minutes wins the challenge of the day. The names of the four (4) fastes challengers will be on display at each store’s Leader Board and will be updated every time a new record is set. 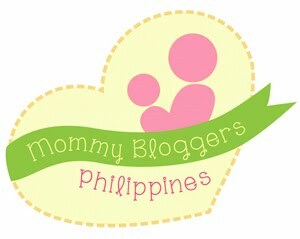 After the weekly qualifying rounds, all qualified participants will be notified via phone call or email and are automatically entered in the grand finals, which will be held on February 23, 2013, 1 pm, at the Glorietta Activity Center in Makati City. During the final match, all finalists will compete by eating the most number of bowls in 15 minutes. The top three (3) finalists with the most number of bowls consumed and the least weight left after 15 minutes will be declared winners of the Yoshinoya Beef Gyudon eating challenge. 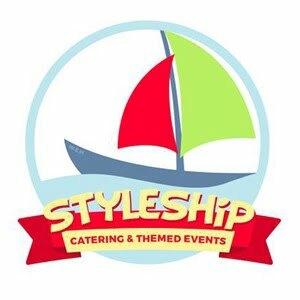 First place winner will receive P100,000, second placer gets P50,000 while the third placer takes home P25,000. 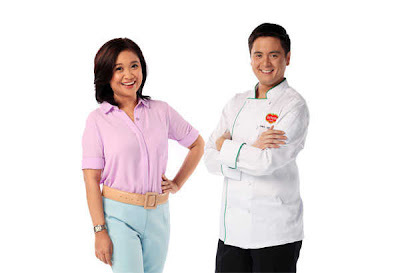 Non-winners will each be given consolation prizes of P2,000 worth of Yoshinoya gift certificates.